Marquette's blowout victory against Cincy was a great win. It was also notable for a few reasons. Let's take a look at the four factors. 141.2 was the second-highest offensive efficiency for Marquette in 2.5 years, behind only the Coppin State game from last year. As has been recapped in many places, the key to this game was both the offensive performance (shooting 15-25 from three) as well as the defensive performance. Although it was the offense that got most of the pub, I actually think that it was the defense that was the most important. Marquette's season average defensively is 93.6, and this game was well below that. In fact, the eFG% was the fourth lowest in 2.5 years, which by itself would have been enough to win the game. Still, it wasn't just the defense alone that keyed the victory. Obviously, Marquette was dynamite behind the arc. This was also an off the charts performance, with the highest offensive eFG% in the last 2.5 years. I consider this especially impressive because Cincinnati came into the game as the #10 country at limiting eFG%. Combine offensive and defensive performances that are off the charts, and you end up with a soul-crushing victory against a Big East Opponent. The big question... is this just a statistical anomaly, or a sign of the team improving at both ends under a new coach? The right answer is probably a little bit of both. 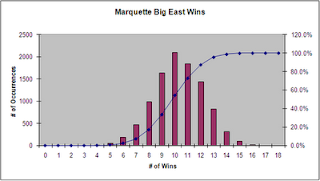 Given the improvement and wins, how do Marquette's chances look for the rest of the season? I'm not expecting a lot more than my New Year's Resolution, but the news is better. Pomeroy presently has us finishing with a most likely record of 11-7 in conference. Right now, I see a most likely view of 10-8 in conference (21-10 overall). If you're an optimist, there is an >80% chance of finishing with a record of 9-9 or better, with a 66% of finishing with ten wins or more. There's even a 13% chance of getting to 13 wins based on the statistics today. If you're a pessimist, there's a 45% chance that the team ends up at 9 wins or less. Win on Wednesday, and the team practically ensures itself a record of 0.500 or better, with a solid track of finishing with a better record than last year. I am thoroughly impressed with MU's % from behind the 3 point line. But, the reality of the situation we're going to need performances like this against some teams with big men i.e. ND, UCONN, GT, etc. If we can shoot responsibly well outside and play MU defense there is no reason we cannot beat anyone home or away in the Big East. I'm thinkin' we have all the makings of a team to make a deep NCAA run.